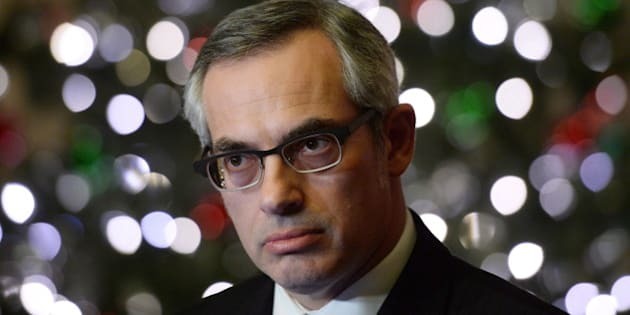 OTTAWA - Among Tony Clement's stack of Christmas bills this year was one to pay back taxpayers for a second set of gold-embossed business cards that broke government rules. Clement, the Treasury Board president, used his personal credit card last week to reimburse his department $195.98 for gold-embossed cards that were ordered back in 2011, when he first took the cabinet post. The Jan. 8 payment was in addition to the $434 he reimbursed taxpayers last month for another set of forbidden gold-embossed cards. Clement has now paid back $630 for improper stationery, which he says was ordered in error by a staff member. Each set of his cards featured the Arms of Canada decorated with gold leaf, a costly stationery option that has been banned across government since 1994. Through the Access to Information Act, the Canadian Press obtained invoices, emails and other documents on Dec. 3 showing Clement's office ignored the rules shortly after the Conservatives won a majority in 2011. The same day the documents were released to the news agency, Clement used his Visa card to pay back taxpayers for the first set of business cards. The amount repaid was calculated as the extra cost for having the gold leaf applied. Other documents released this month, however, reveal a second set of Clement business cards with the same gold-leaf problem. The second set, also ordered in 2011, added a reference on the card to the minister's secondary portfolio, the FedNor development agency. Clement paid back the second amount on Jan. 8, a day before these other documents were released to The Canadian Press. "We have been assured by Treasury Board officials there is no remaining amount owing," the minister's spokeswoman, Heather Domereckyj, said in an email Monday. "Minister Clement personally reimbursed the cost as soon as he was alerted. This was brought to the minister's attention when the department provided additional documentation for the ATIP (access-to-information request)." Laurie Hawn, a Conservative MP appointed temporarily to a cabinet cost-cutting committee, also got his own set of gold-embossed cards in 2011. His spokesperson, Jordan Fraser, has said Hawn also reimbursed taxpayers for the error but did not provide the date or amount. Another cabinet member, Foreign Affairs Minister John Baird, in 2011 ordered a set of English-only business cards, violating government policy against unilingual communications. Ministers' business cards must include French and English. Baird's cards also featured a gold-embossed Arms of Canada, breaking the same stationery rule as Clement and Hawn. Clement's department, the Treasury Board, sets out the rules for all ministers' stationery, which specify that Canada's coat of arms on business cards must be in black. The only colour permitted is the red of a small Canadian flag above the Canada wordmark. The rules date from 1994 during the Liberal government of Jean Chretien. Baird has never acknowledged any "error" for his unilingual, gold-embossed cards. He has defended his unilingual cards by saying he also ordered a second set of bilingual cards that were always available for distribution. Canada's official-languages commissioner, Graham Fraser, issued a report last August slamming Baird for ignoring language policies, and demanded the English-only cards be dumped. Fraser's office, which rejected the argument there was no violation because other bilingual cards were also available, said this week the commissioner was still waiting to hear whether Baird will abide by last summer's ruling.